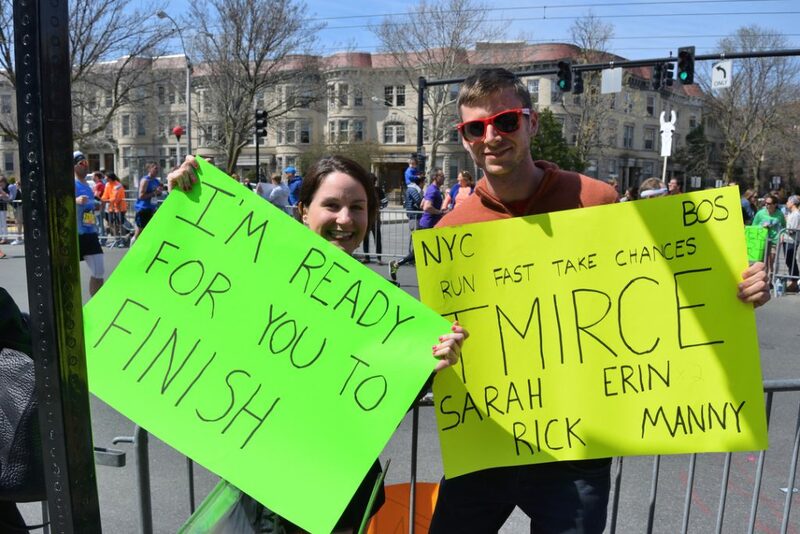 So you’ve made the commitment to cheer on some runners in a marathon – great! You’re a rockstar. But while many rockstars live on the edge, you get your kicks from preparedness and careful attention to detail (hell yeah!). So I’ve come up with a checklist to ensure that your cheering is a successful as possible! First thing’s first. 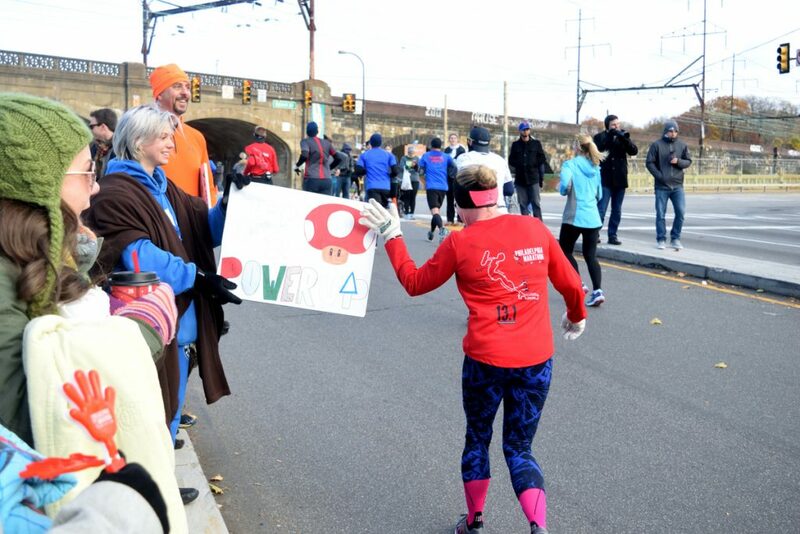 As a runner, seeing one person cheering on an otherwise abandoned straightaway is great. But seeing a whole crowd cheering in unison is exhilarating. You, the provider of cheers, can assemble that crowd! Bringing some friends to the party will allow you to make an even bigger impact. 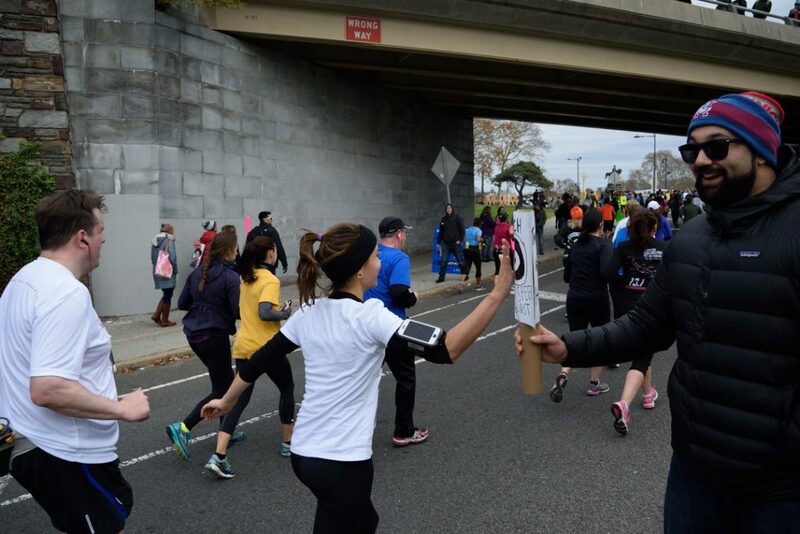 Your cheers will be louder and the runners will have more friendly faces to look at! Also, you will be able to divvy up some of the cheering responsibilities between members of your group. 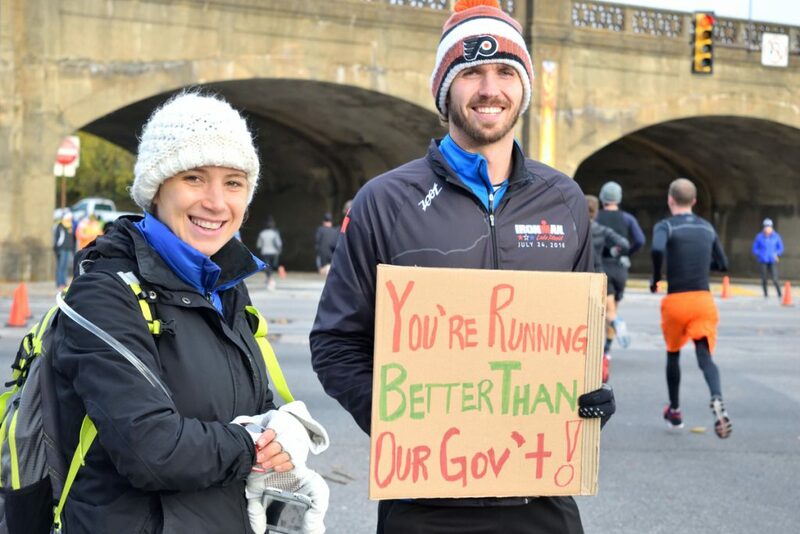 That means you’ll do an even better job encouraging the runners with less individual work! That being said – if you have a very large group of people interested in cheering, I would recommend splitting into multiple cheer zones. What’s the difference between having ten people cheering and fifteen? Not much – they’ll both have a major impact. So spread that energy across the course! When you settle into your cheer spot, it’s going to be quiet. Very quiet. And it’s that silence that can push a runner into a tough battle between body and mind, especially during the later miles. That’s where you come in! Music is arguably the most effective tool for energizing a tired runner. All you need is a speaker and a killer playlist! Bluetooth-enabled portable speakers are easy to come by nowadays – there’s a whole section devoted to them on Amazon! Basically, you want something weather-resistant and with loud bass (the sound will travel further this way, making your speaker effective over a longer distance). Depending on the model you decide on, it might be a bit of an investment. But you probably wanted a portable speaker anyway – at parties and family gatherings, for example. Here are some examples of options. My personal favorite is the FUGOO Sport XL. It’s quite steep at $199, but it’s completely weather-resistant and LOUD (38 watts! ), and the bass packs a punch. I’ve used it at several races and it usually elicits a great response from the runners. A cheaper alternative is the OontZ Angle 3 Plus, which comes in at $29.99. 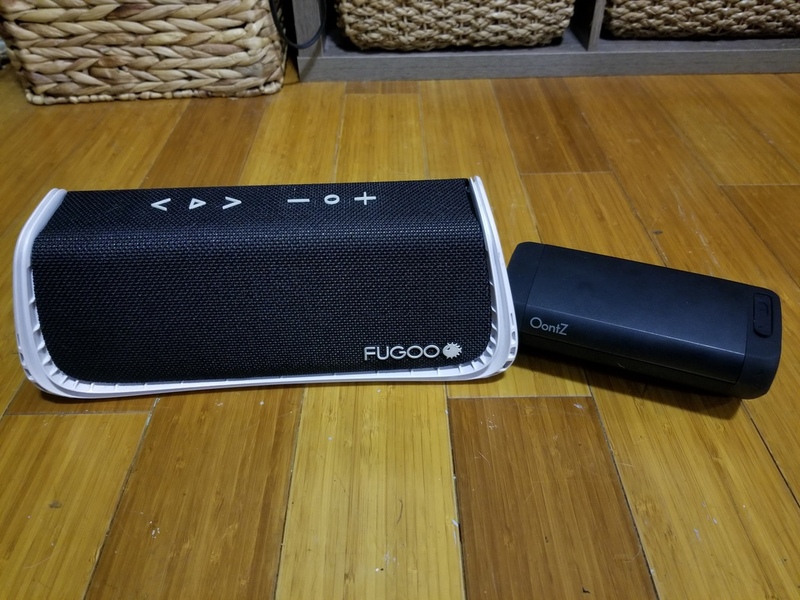 It’s smaller and more portable than the FUGOO Sport XL, but you only get 10 watts of volume. It has thousands of reviews on Amazon with an average rating of 4.5 out of 5 stars. I bought this speaker in November of 2017 and use it a lot around the house, but haven’t tried it out for cheering yet. The sound is nice and clear! A third option is the AOMAIS Sport II, which comes in at $39.99. It’s 20 watts, so you’ll get twice the power of the OontZ without paying anywhere near the price of the FUGOO. Fun fact – people have tried deliberately running this speaker over with a car and it came out in decent shape! Make sure your speaker is fully charged the night before race day! Also, figure out how to pair your Bluetooth speaker with your phone in advance. As for playlists, I get mine on YouTube. If you have a YouTube Red account, you can download playlists directly to your mobile phone in advance and play them without having to worry about data usage. If not, no worries! 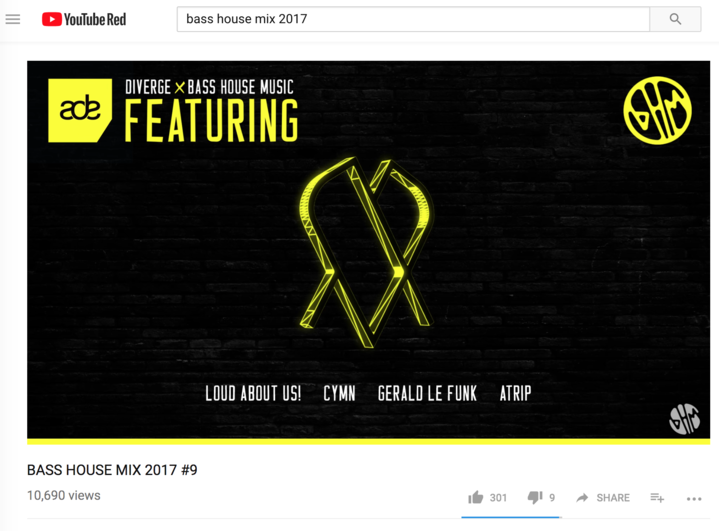 Many of these mix videos provide a free audio download in the description, usually in exchange for following the creator’s social media accounts. Another option is to use an online “YouTube To MP3” service on a desktop or laptop computer and email it to yourself to download on your mobile phone. I won’t link to these services here, as they can be used to download copyrighted music illegally, but a quick Google search will get you some hits! You could also use Spotify, Pandora, or any other music streaming service. Just keep in mind that if you have a free version, nobody is going to enjoy listening to the commercials! One last option is to just put together a playlist of songs you already have on your phone. You don’t need all that many songs. You could loop the same tune over and over again, and none of the runners would even know – they’ll be gone by the time the song restarts! But for the sake of your sanity, I’d recommend diversifying the playlist a bit. You’ve got a kickass playlist. Now it’s time for some visual entertainment! 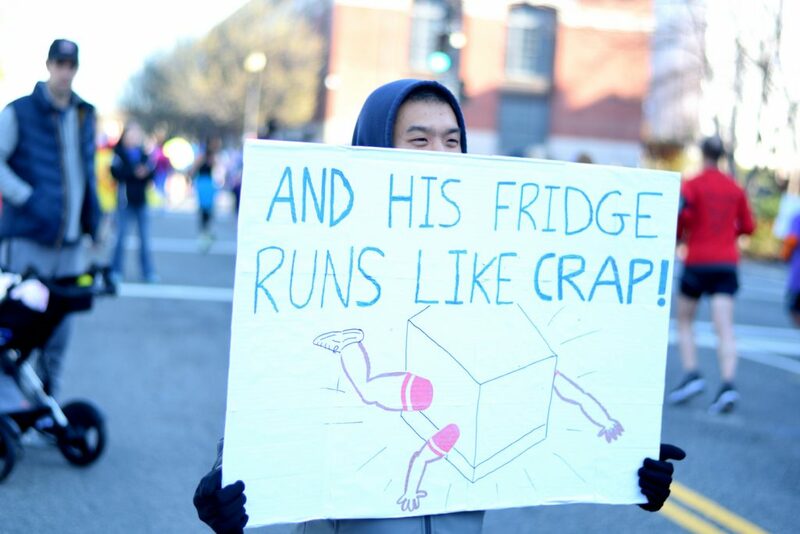 Like music, signs distract runners from their pain. But while the music will fade out and likely be forgotten, a good sign will be remembered for much longer. It might even be a topic of discussion among runners drinking their post-race beers! Especially if you’re the lone party transforming a quiet space into a full-fledged cheer zone. 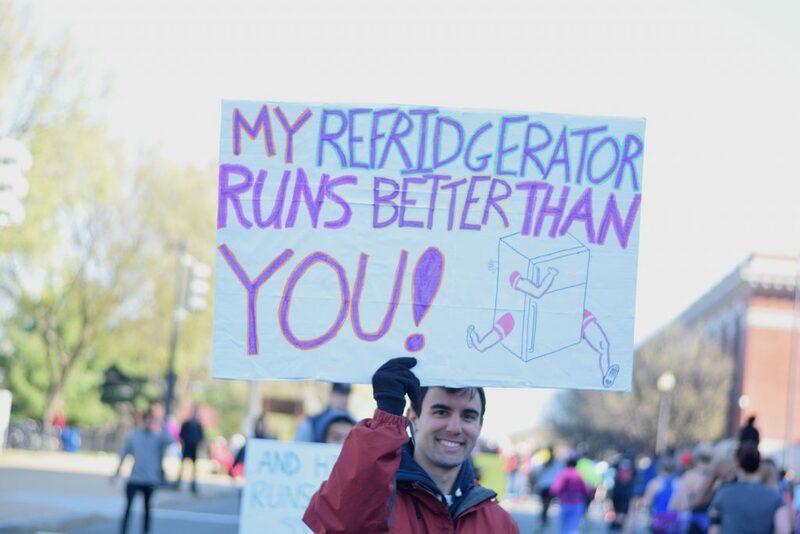 Runner’s World put together a collection of funny signs that could serve as your inspiration. As you can see, some are more elaborate than others. Feel free to put in as much effort as you are able (but keep in mind, words are often enough to make an impact!). 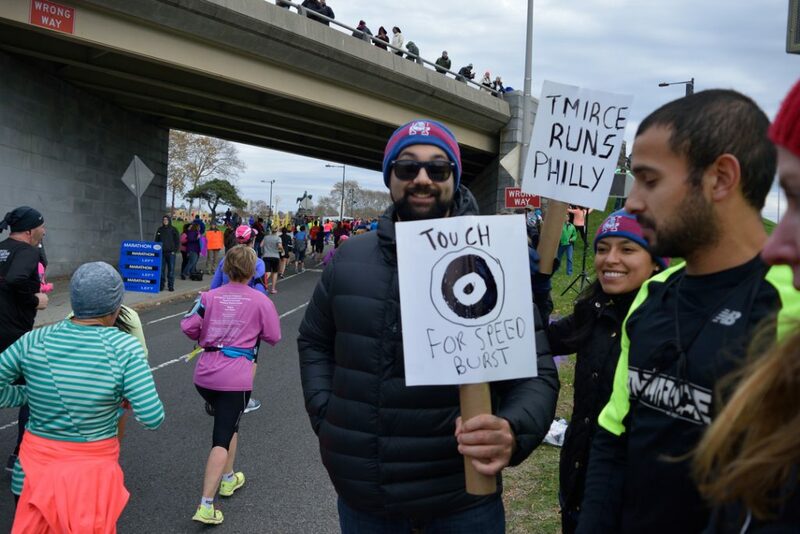 My run club had a nice “Touch For Speed Burst” sign at the Philly Marathon, 2015. You’ve got your music and your signs. Is that enough? Sure. But if you’d like to add some spice to your cheer – get some noisy props! The most popular props I’ve seen are cowbells and clappers. They’re great because you can shake them continuously to create a steady stream of sound. In conjunction with the music, they really do help create a lively atmosphere. Plus, everything’s better with more cowbell. I sometimes use a vuvuzela (see the photo above). The “vuvu” is a bit more controversial – some people love it, some people find it a bit…much. The sound will project quite far, so it has the advantage of being a powerful “wake-up call”. But it’ll tire your lips out and is not suited for continuous use like a cowbell. It may also annoy other spectators and it will definitely frighten pets, so make sure you’re really in a dead zone before using it! Lastly – if for some reason you have to decide between bringing music or noisemakers, there’s no competition. You need music! I find that a cowbell in the middle of a dead zone is actually kind of sad without music behind it. Whereas a good, energetic playlist stands fine on its own. Just something to keep in mind! You’ve got your music and your signs ready, and you’ve arrived at your cheer spot. Great! But after an hour of cheering, you’re starting to get hungry. And thirsty. Cold. In need of another cup of coffee. And regretful that you didn’t anticipate these feelings before making the trek out here. Make sure to eat a hearty breakfast. Cheering uses a lot of energy, and you’ll need all the nutrients you can get! If you’re a coffee drinker, have some with breakfast and buy a cup to bring to the cheer spot if you think you’ll need it. It will also keep you warm on a cold morning. Buy some snacks from a convenience store, along with a few bottles of water. I’m a fan of Fiber One bars, especially the lemon and chocolate chip flavors. You can buy a box of six for cheap at any Walgreens. Check the weather, and wear appropriate layers. If it’s cold, bring a hat, gloves, and hand warmers. Err on the side of bringing too much stuff. You can take your excess layers off at the cheer spot if necessary. One last thing to bring is a camera. You can use your smartphone for this if you’d like (note: if you’re using the free version of YouTube for your music, it will pause whenever you try to take a picture. This does not happen with YouTube Red). I like to use my DSLR for this purpose (I have the Nikon D3300). People tend smile for the camera. It’s an instinct. Bring out those smiles! If people you know are running the race, they might just have a new profile picture if you get a good shot! I like to photograph runners representing the local running clubs I recognize and tag them in the photos. 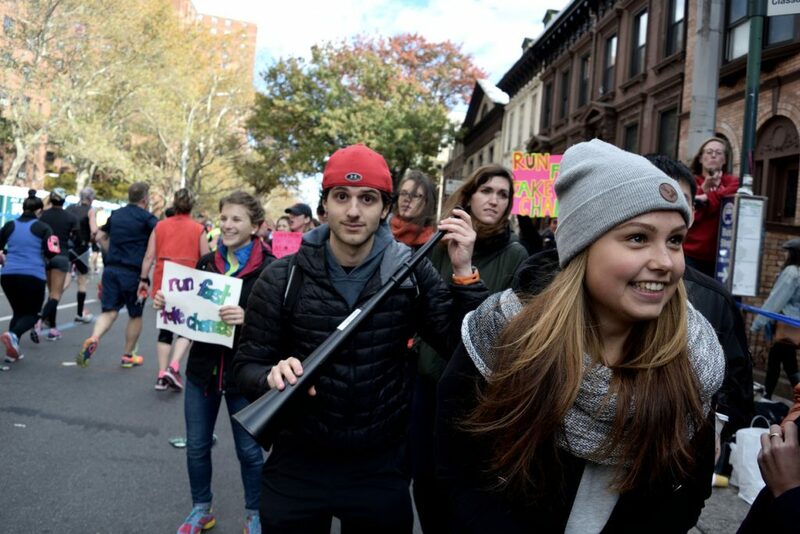 I live in New York City, and there are many such groups here, but some examples include: Prospect Park Track Club, TMIRCE NYC, Central Park Track Club, Gotham City Runners, Dashing Whippets, and North Brooklyn Runners. It’s out of deference to the running community here, which I truly love. So there you have it! You have all the equipment you need to bring your best cheer! Now you just need to ensure your execution is as smooth as possible. Check out this section to learn how to do just that!